From his vast experience in the field, coupled with a degree in environmental economics from Boston University, Fabien Cousteau has refined a public policy platform grounded by his strong belief that environmental discipline can be the basis for innovative solutions that strike a balance between regional and global environmental problems and the realities of market economies. 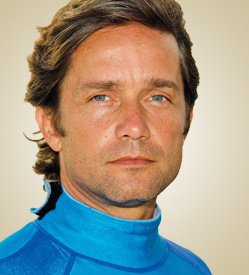 Cousteau has worked with National Geographic, Discovery, PBS and CBS to produce ocean exploration documentaries from 1998-2006. In 2006, Cousteau partnered with his father, Jean-Michel Cousteau, and sister, Celine, for an ongoing multi-year multi-hour series for PBS called Ocean Adventures. He is also well known for his intensive study of sharks and CBS documentary, Mind of a Demon. In 2010, he launched Plant A Fish, an innovative nonprofit organization designed to empower communities and children to help restore their local water ecosystems through the healthy “replanting” of key marine species. Current initiatives include restoration projects in El Salvador, New York City, South Florida, Nicaragua and the Maldives. Expansion to Haiti, Dominican Republic, Bahamas, Indonesia and Washington DC is expected in 2013 followed by Greece, California, Mozambique and Nova Scotia in early 2014. An active writer, he is currently working on a children’s book trilogy. Cousteau is routinely seen on network television. He shares his guidance as a member of multiple Boards including SeaKeepers Society, Water Innovation Alliance, Millennium Project, Blue Ocean Film Festival, Plastic Pollution Coalition, One World One Ocean, Points of Light, Antarctic Ocean Alliance, Aquarius Foundation, Bahamas National Trust and the New York Harbor School. This summer, Cousteau and his team of five will dive down to an undersea lab 63 feet down in the Florida Keys National Marine Sanctuary. They will make the school-bus-size lab their home for 31 days, while exploring the deep and conducting scientific research. The mission will be broadcast live.